Where to Order a Sturdy Wooden Freight Crate in NYC? Freight comes in different sizes and shapes, each with specific packing requirements. Whether you are selling or buying, your top priority is to ensure that your freight arrives at the destination in the same condition as it left. It goes without saying that the most important factor in achieving this goal is proper packaging. This is particularly true if you need to ship fine art or any other valuables that can be easily damaged in transit. In such a case, soft packing is not enough to protect your cargo – you need a sturdy wooden freight crate built to withstand the rigors of the long-distance transportation. So where to order a high-quality freight crate in NYC? There are many reliable crate and shipping companies in New York. However, if you are looking for the safest way to ship antique and art pieces, Fine Art Shippers is the right place to come for help! We not only provide our clients with a variety of transportation options, both national and international, but also offer in-house packing and crating services of the highest quality. 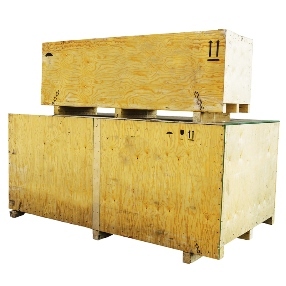 Our team of professional crate makers can design and build a wooden freight crate to accommodate any cargo dimensions (standard and non-standard), giving a safe, secure, and flexible method to protect fragile items in transit. As you know, whether it comes to shipping freight by road, rail, sea, or air, it is never a perfectly smooth ride. Even little vibrations and bumps can jostle your possessions around, which can easily lead to damage. At Fine Art Shippers, we understand that and, therefore, take care of every single step of the packing and crating process. Each freight crate we manufacture is tailored to meet the shipping demands of the transported item, minimizing any potential damage as much as possible. Moreover, we do not have any size limitations and can build a sturdy wooden freight crate of any type. One more important reason to order a freight crate from Fine Art Shippers is that all our packing and crating services for shipping items of any size and weight are very competitively priced. You can easily verify this by requesting a free quote right from this website. Our team will provide you with the most accurate and detailed quote calculated in full accordance with your needs and requirements. You can also contact us by phone or email if you have any additional questions.